« Now I cannot get that song outta my head………. Have you ever wonder why……………………. …………..my blog is called “Crouching Dog” Well Dennis and I just pretend that we are in charge of our house. The true rulers are Monty and Jilly, our precious fur children. These two little ‘persons’ run the show. It’s been very cold here in Trendy Tenterfield, so Dennis has built the kids an insulated and carpeted kennel, which sits inside our shed. The kennel also has a roof (carpeted of course!) and a doona and blankets AND, AND, AND an electrically heated mattress. (yes you can buy them for your precious pooch). 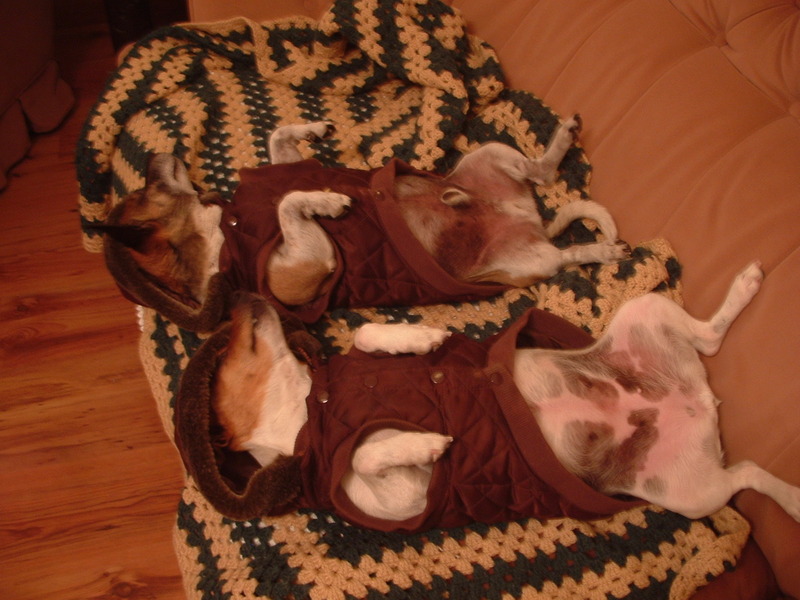 We were still worried about the kids being cold in bed so we purchased these sensational little coats from our local Pet Store (Hi Belinda!!!!). The coats have little fur trimmed hoods and all. They are soooooo cute. This photo is taken on my good velvet lounge (with a crocheted blanket covering it – barely!) just before going to bed. OMG that picture makes me laugh so much!! They are sure relaxed puppy dogs!! Josh thinks it is hilarious too! Fur children Claire. Not dogs! Hush your mouth! Oh Jacqui. Always told you they are gorgeous ‘kids’ and very loved, and being allowed on the lounge!! Jess would be so jealous – you could always make her a ‘castle’ Dennis! Oh Sue! please don’t suggest that! He’ll do it you know. I too have given in this year and bought me Piper two coats, a quilted one for inside and a fur lined waterproof one for outside (reminds me…the outside one needs a tub!!) with the cold weather and the girl gettin’ on a bit…….someone needs to buy me one too LOL!! I love your coats though Jacqui………so very chic!! Ohhh, I miss Monty & Jilly. What a great picture!! !